10 Best Holiday Destinations in Spain - Where to go in Spain? Spain has been one of the top destinations for British holidaymakers for decades now, closely rivalled by France and Portugal. And why wouldn’t it be? Miles of beaches, gorgeous weather, delicious food and breathtaking views are all waiting for you a simple flight away. Spain is rich in history and gorgeous architecture, ensuring you’ll never be bored and will get more than your cultural fill. 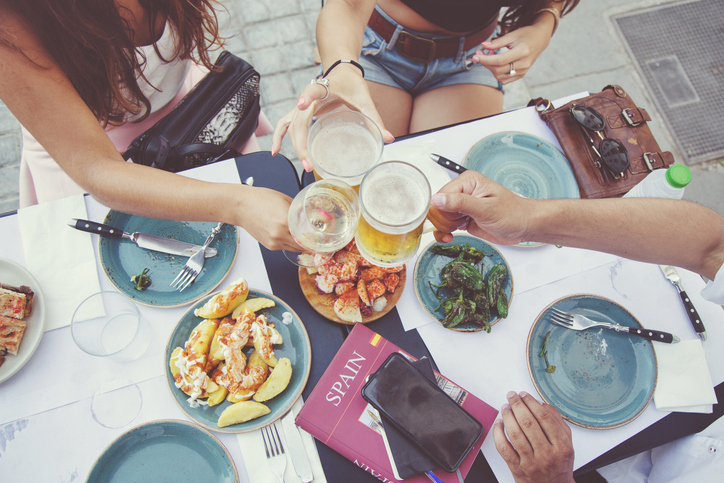 There are countless places to go in Spain, but the main ones you usually hear about are filled to the brim with tourists and have begun to lose their true culture. Instead, I’m going to share 10 of the best holiday destinations in Spain, and ensure that they’re not all obvious choices or busy metropolitans! Situated in Northern Spain, Santander is known by locals as where to go in Spain for the best beaches. 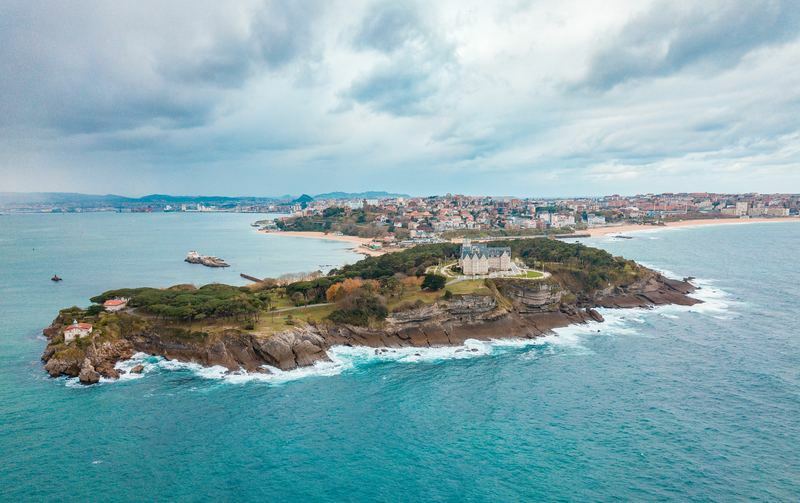 Comprised of a stretch of coastline called the Costa de Cantabria, the views from this city are hard to compete with. Playa de la Magdalena is one of the most popular swimming spots, but there are dozens more. At the Península de la Magdalena, you can enjoy a lovely picnic and stroll accompanied by amazing views of nearby beaches and the crashing sea. There are even resident seals and penguins to be spotted, and children will adore the replica Spanish galleons and a little train to take you around the headland. After the beach, enjoy a trip to the stunning Catedral de la Asunción, a serene cathedral composed of two Gothic churches from the 15th and 13th century. In these churches you can view relics of Santander’s patron saints and catch a glimpse of ancient Roman foundations through the glass floors. Santander is also one of the best places to go in Spain for seafood, as the fresh catches will almost crawl onto your plate! Treat yourself to delicious tapas and seafood at one of the various places lining the coast. Whilst there, ensure you visit El Machi for the best breakfast of any trip you’ve taken, for who knew we could stomach or even enjoy seafood before midday? Nerja is but a few miles away from the bustling beaches of Malaga on the Costa del Sol. This charming coastal destination is located at the foothills of the Sierra Almijara Mountain Range. This traditional fishing village has grown into a wonderful beach destination, yet has managed to retain its authentic Spanish atmosphere. Its proximity to Malaga is perfect for a day out to this bustling area, but ensures that your trip can be calm when you want it to. Enjoy the pleasures of one of Spain’s best beaches without the invasion of tourists and litter. There are 8 km of beaches in Nerja, and the busiest is Den Salon Beach. The water is clear and shallow, making it perfect for younger visitors. 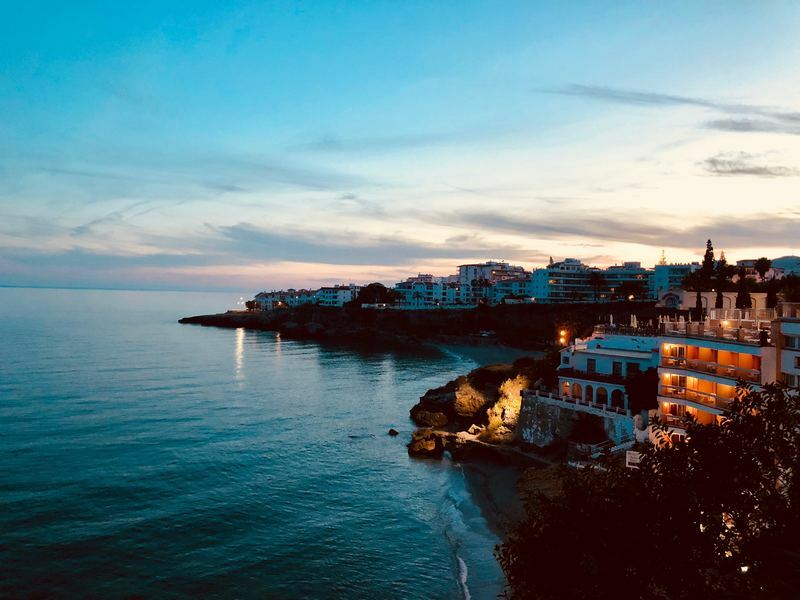 For spectacular views over the water, make your way to Nerja’s Balcony of Europe, where you can look down at the sea from the site of an ancient castle. For accomodation, we recommend Camping Nerja, a rustic site run by a couple. Despite minimal facilities, campers love this location for the simplicity and close proximity to beaches and touristic sites! If you’re looking to mix up your usual holiday, perhaps the kids are getting older and coming along more grudgingly, then Lanzarote is the trip you’re looking for! Lanzarote is a Spanish island, the northernmost and easternmost of the Canary Islands. 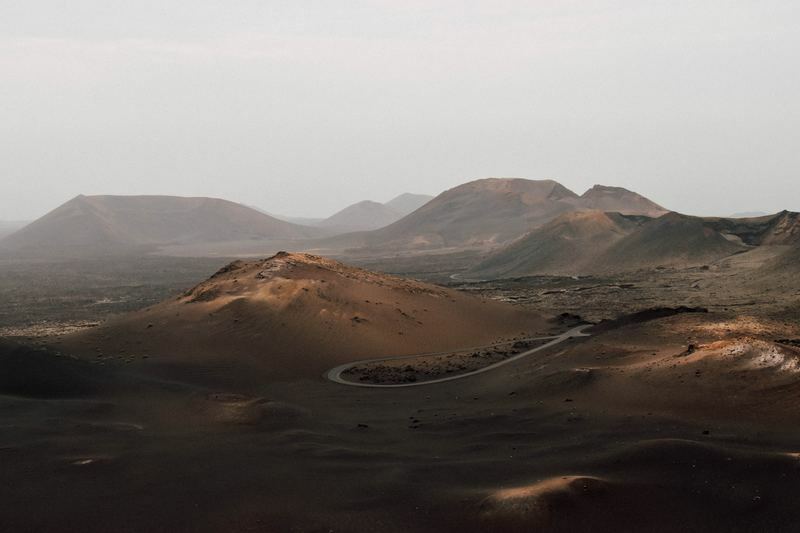 Lanzarote is best known for its’ extraordinary geology of 300 volcanic cones. You can tour these cones, take a hike, or even ride a camel up them! All this excitement will surely tire you out, so then you can spend the rest of the day relaxing at one of their numerous gorgeous beaches, swimming in the stark blue waters. If you’re looking for some history, you can visit one of the numerous museums of Lanzarote. The entire family will love the Museo de la Piraterίa, a modest yet fascinating museum located in the 16th century Castillo de Santa Bárbara. This is the oldest castle in the Canaries, which adds to the drama of the museum, perched up on Guanapay peak with breathtaking views across the plains. The museum exhibits the numerous attacks Lanzarote suffered at the hands of pirates from across Europe and Africa throughout the 16th century. Despite its’ terrifying topic, it is a true win for the kids! For camping on this wonderful island, we recommend Camping Papagayo. This simple site is located in the Southern part of the island, is family run and constantly recieves great reviews! When considering where to go in Spain, Barcelona surely came up on the list. And whilst I promised to share less obvious places, I couldn't help but include Barcelona. For even if you simply pass by it enroute to other destinations, this is one of the most important places to see in Spain. Barcelona is the capital and largest city of Catalonia, as well as the second most populous municipality of Spain. This thriving city is filled with breathtaking architecture, including works by Gaudi. You can already visit La Sagrada Familia, despite it being under construction. Your entrance fee for viewing what is considered to be Gaudi’s masterpiece will help fund the project. 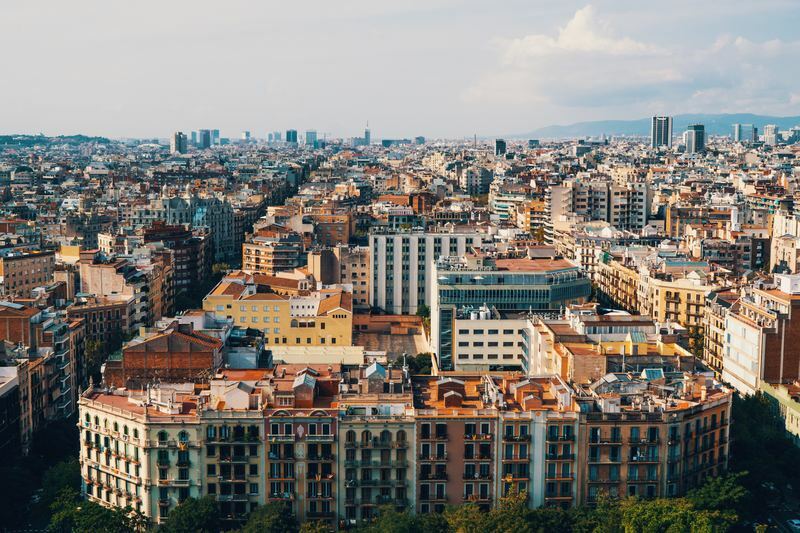 Aside from architecture, Barcelona is drenched in Catalan culture, which you’ll get to experience even by navigating through the bustling streets and tasting the delicious delicacies. Personally, I can’t help but recommend visiting La Boqueria market to stock up on fresh food and delights, and then heading to a park for a picnic. Parc de la Ciutadella is gorgeous, and was one of the city’s first green spaces in the 19th century. This park is also home to the Barcelona Zoo, where you can catch a dolphin or sea lion show. Due to the metropolitan nature of Barcelona, camping nearby can be slightly difficult. But close to the city there is Camping de Codina, a simple site with close access to the city centre. Slightly further away there is Camping Masnou, which began in 1956 and is currently the oldest campsite in Spain! It is a luxurious site, close to the beach and with a swimming pool, bar, restaurant, supermarket and more. There is 24h public transportation, and you can reach the city centre with a 15 minute train ride. 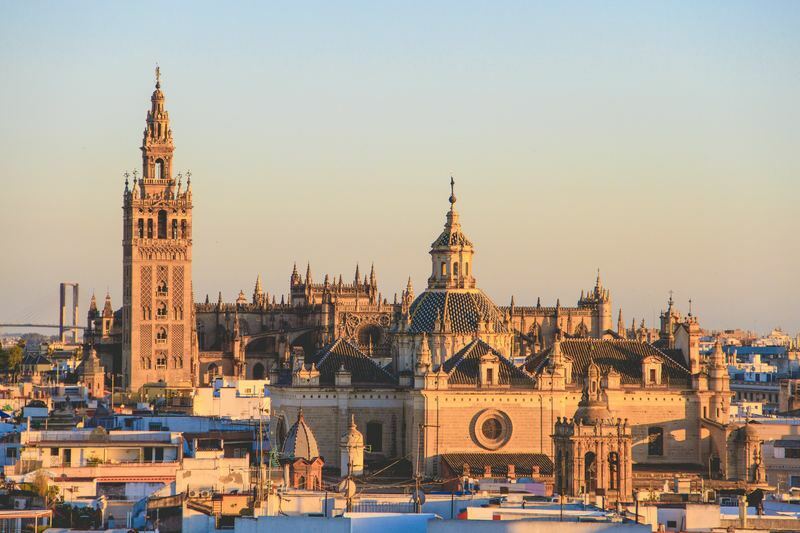 Seville was originally founded as a Roman city, but has since grown and flourished immensely, becoming home to three UNESCO World Heritage Sites! In the heart of this city, you can view the remarkable monumental complex comprised of the Cathedral, Alcázar and Archivo de Indias. They epitomize the Spanish “Golden Age” whilst incorporating vestiges of Islamic culture, centuries of ecclesiastical power, royal sovereignty and immense trading power. The sites were built from the 15th century to the 17th century, and have been upheld well. Seville is also the capital and largest city of the autonomous community of Andalusia. There are numerous other sites to explore in Seville, including Europe’s first tobacco factory, the Museum of Fine Arts and the most beautiful gardens and parks Spain has to offer. Seville is definitely a place to visit for those who enjoy remaining active and exploring during their holiday. It is deeply dipped in culture, and whilst here you’ll be delighted by the traditional architecture and cuisine. It is also the birthplace of flamenco, so we recommend going to see some whilst here, or even giving it a go yourself! Not to be confused for the popular tourist destination of Majorca, Menorca is the more relaxed cousin of the party town. Menorca is actually the first place in Spain to see the sunrise, so make sure to wake up early one morning to witness it. Menorca has beautiful beaches that encourage a variety of watersports, yet somehow are not crowded in the slightest. It has beaches for all types of travellers, with Playa De Binigaus being recommended for families, and Cala Mitjana which is considered an idyllic spot for romance. 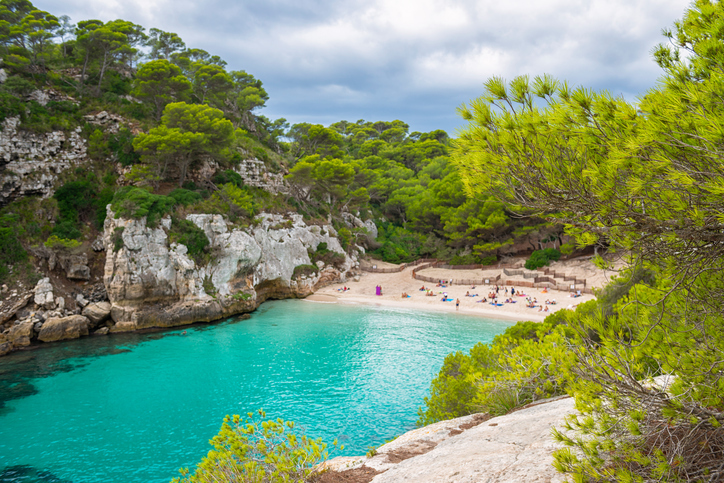 Menorca is the perfect holiday destination if you’re seeking tranquility. Use your time there to munch on the delicious local cheese or seafood, whilst catching up on some paperbacks and wandering along the shores. This little island is your perfect paradise escape! Before considering whether or not to come to Aranjuez, search online for Concierto de Aranjuez by Joaquín Rodrigo. This is considered to be one of the most beautiful pieces of music to come out of Spain, and was inspired by the sights, sounds and smells of the lush gardens of the Palacio Real, in Aranjuez. The beauty of this song only begins to summon up the beauty of Aranjuez, so you’ll have to go yourself to truly understand it. Visit the Palacio Real, which was commissioned by Philip II in the 16th century, and later inspired by Versailles. Aranjuez is also renowned for its strawberries, and has a Strawberry Train comprised of antique carriages pulled by a steam locomotive. The Strawberry Train runs to and from Madrid on spring and autumn weekends, with staff in period dress handing out strawberries. You’ll be able to pick up some delicious strawberries to take back to your campsite and enjoy in the cooling evening. You can stay at Camping Internacional Aranjuez and enjoy their extensive facilities. The campsite has a restaurant and supermarket, as well as a lovely pool to cool off in after a long day of exploring the surrounding area. The playground and pool slide will keep your children happy and tire them out quickly for a calm evening. 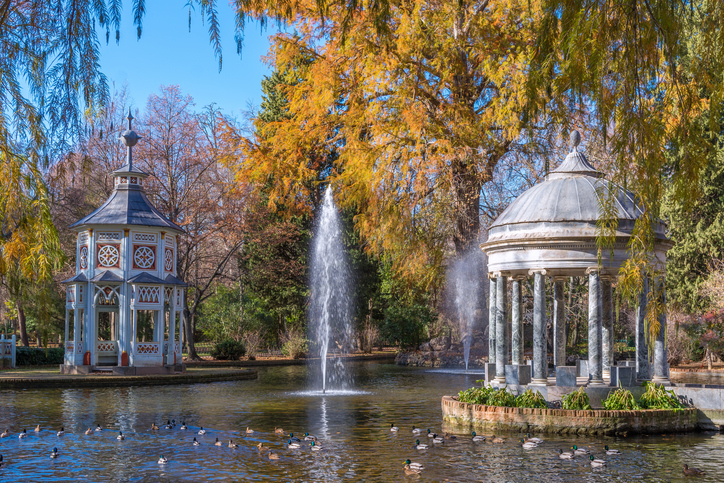 From Aranjuez, you can easily reach Toledo and Madrid, making this the perfect spot to explore your surrounding areas whilst relishing calm evenings. One of the top perks of Cuenca is its ideal location, given that it is less than an hour by high-speed train from Madrid. Yet despite its proximity to such a major city, Cuenca appears to be in the middle of nowhere, and manages to remove you from the bustle and stress of the metropolitan area. 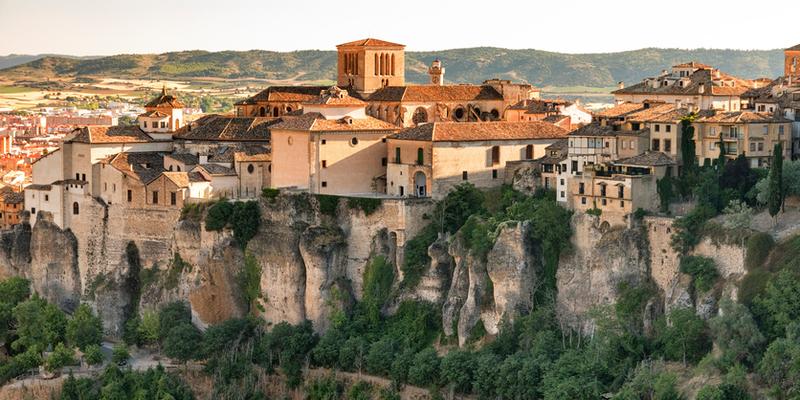 Cuenca has World Heritage Status, and once you’ve seen this breathtaking city, it isn’t difficult to see why they consider it one of the necessary places to see in Spain. The city is set on a dramatic limestone spur between the Júcar and Húecar rivers. You’ll be shocked and slightly afraid when seeing the extraordinary medieval ‘Hanging Houses’, spilling over the top of the gorge. One of these buildings is the Museum of Abstract Art, which features works by Antonio Saura, Antoni Tàpies and Eduardo Chillida. The museum was founded in the 1960s by popular artists who felt that remote Cuenca would be a place where they were safe from Franco. This began the view of Cuenca as a haven for free expression, and as a hidden paradise. It has remained so, avoiding the gaze of major tourism and keeping its rich culture. If you plan to visit this breathtaking city, we recommend pitching camp at Camping Caravaning Cuenca, which is only 7 km from the city centre. It is in a beautiful location, surrounded by pine groves and on the river bank of the Jucar River. The site hosts a supermarket, restaurant, playgrounds and numerous sport areas. The surrounding area is beautiful, and a hike or bike ride around is a necessity. This is one of the best places to see in Spain for nature, as this national park is rivalled by few. It is considered to be one of Europe’s most spectacular walks, and yet has managed to avoid being overrun by tourists. Monte Perdido National Park is situated in the Pyrenees of Huesca province in Aragon. It has been a national park since 1918, but the protected area was enlarged in 1982 to cover the entire region. 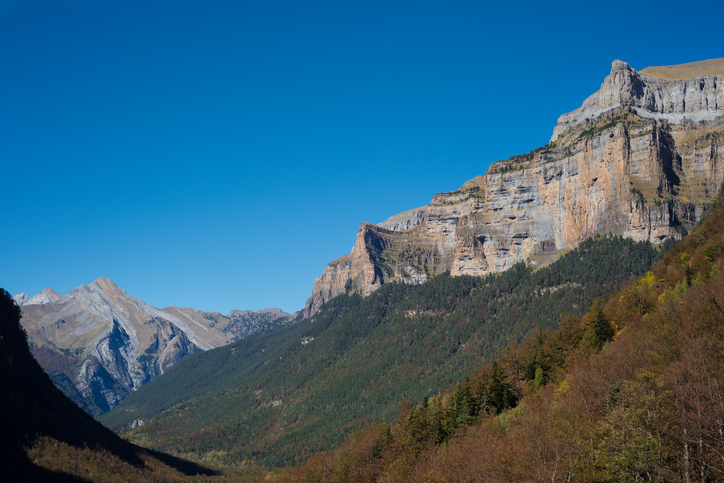 The showpiece of the park is their path through the Ordesa canyon, which follows a dazzling river between formidable 3,000ft walls with a fantail waterfall finishing off the masterpiece. There are also balcony-style trails with incredible views, for those who can stand the heights. The park boasts of amazing wildlife, including their population of lammergeier vultures with 10ft wingspans - keep your baby close at all times! There are numerous campsites in the area, as well as options for wild camping. Just be sure to check before you camp and follow the general wild camping rules! Located about halfway between Madrid and Valencia, this mountain range is a perfect road trip stop between the two major cities. This is the least-populated area in Spain, so you’re ensured the calmness and tranquility that is a rare occurrence in such amazing areas. The mountain range is 32 km long and has a highest point of 1,935 m known as Caimodorro. Another important peak is the Muela de San Juan, which is 1,830 m. The range is covered in rich forests and has numerous trails to follow. When considering where to go in Spain, this mountain range should make the list for any avid hikers, bikers or adventurers. There are campsites around, and wild camping is permitted for a single night per location with the arrive late, leave early mentality. There you have it, our pick for the 10 best holiday destinations in Spain! As promised, there was a wide selection to suit all the needs for holidays. Whether you’re a beach bum, a hyper hiker or a city chum, you’ll be able to find a place for you. And why settle for one? 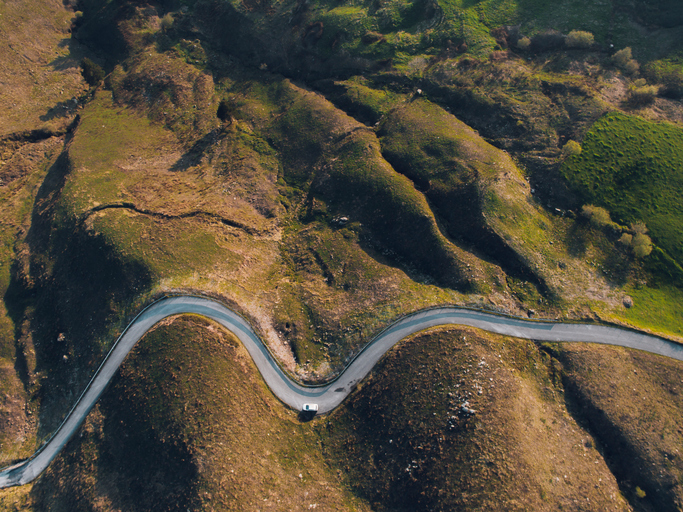 Check out our motorhomes in Spain, find one that fits you and make a road trip out of it! Spain is to gorgeous for your holiday to consist of a few days in some tourist filled city, visit the true heart of España!